To achieve these figures in a compact sized cabinet, you need a specially designed driver – the EMES XLS-Driver! 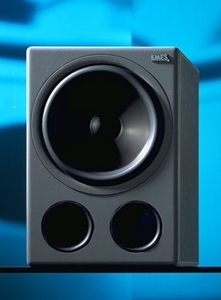 XLS-driver is a very low compression driver with a coil excursion of +/- 16mm. The driver is constructed in such a way so that the air, normally sealed in the Air gap of the magnet system, can circulate. Finally the Airflow is nearly non resistant to the coil movement, which results in a very accurate (linear) membrane excursion. The Impulse response and Low End precision is really remarkable for Sub-Bass unit this small! And there is no heat related compression either! To support the driver specs we have equipped the removable active electronics with a powerful 2 x 160W amplifier module! The AMBER / AMBER HR has everything on board to allow the units to be used as a Sub-Woofer for multi channel applications, plus functions and controls dedicated to use with our near fields to build a modular 3 way Monitoring system. Balanced XLR - Input and Output connectors for 3 channels (L/C/R) are implemented, these can be used simultaneously as inputs and filtered outputs. The Filter section can be set to operate at 80Hz or 150Hz and be turned off for Surround applications. If the Subs are to be placed in a different listening distance the relative phase can be controlled separately by dipswitches in a wide range from 0 to 360 degrees to get optimal time alignment. The value per Step is 30 degree (equal -35cm at 80Hz). Also the Input level is adjustable by dip switched from +6dB down to - 25dB. A useful feature of the EMES Sub-Bass units is, especially if they are used as frequency extension units for our Near field monitors (MODUMO™), is to bypass the filter section. The signal path than can then be monitored frequency extended (Off), or non extended (On)!